We work on everything technology related! Try our no nonsense, value for money service now. We can repair iPhones, Android Phones &amp; Tablets including screen repairs and new batteries. Training and coaching in the comfort of your own home or in a group - we can teach you how to use your computer, phone or tablet. We can sort out your Internet and Broadband problems in a jiffy! Call us now to get back online fast. We can quickly and easily build your perfect website to showcase your talents! Whatever the problem is with you PC, Tablet or Mac, we can fix it! These are not the usual words used to describe I.T. people or Technology Geeks but these are the words that are frequently used to describe us at Call Ken Computers! Laptop's, PC's, Smart Phones, Tablets, Smart TV's, Mac's - they've become a part of everyday life. To some, they're wonderful things that add joy, to other's they're a necessity for work and to some they can be a right pain - especially if you don't know how they work or they just don't work properly. At Call Ken Computers, we understand people. We don't speak in technical terms and baffle you with jargon. We don't rush through explaining things and leave you befuddled. We don't assume we know it all and you don't - we don't patronise. That's why we're the #1 affordable choice when it comes to getting your PC, laptop, Tablet or Smart Phone fixed. We're a small, family run business with over 40 year's experience in I.T. We have a passion for great customer service, value for money and making technology accessible to everyone. Whether it's repairing a small family computer, setting up a mobile phone or creating a web site, no job is too big or too small. 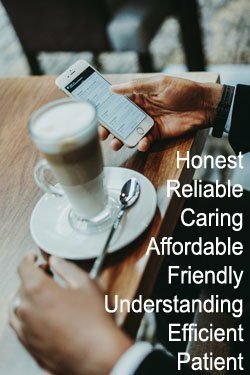 Our friendly and caring approach has helped thousands of customers who not only come back to us but refer us to their friends and family. Our fully guaranteed work is completed quickly, quietly and efficiently in the comfort of your own home with a set fee agreed in advance so you know exactly how much it'll cost - which is often surprisingly little! We will collect and return your equipment (if necessary) at no extra charge. Having a computer or tablet these days is a necessity. Put your trust in Call Ken Computers to look after it and keep it running smoothly. Why not review us on TrustPilot and earn a discount on your next visit?!! For every positive review we get on TrustPilot we’ll give a 10% discount off the cost off your next visit (not including parts / software). So what are you waiting for? – review us now! Need help with that new App or Device? Broadband or Internet on the blink? How about a new web site to show off your talents? Trouble with your mobile phone or tablet?